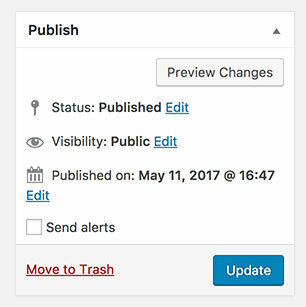 I have a situation where posts can be saved and users can be notified when a post is saved if the "Send alert" checkbox has been checked. I don't want the checkbox to be saved as it needs to be checked only when you want an alert sent out. This allows the admin to save, edit, etc. without any difficulties. And have the save_post hook setup as well which needs to check for the checkbox if it is checked or not and then send out alerts if it is. The question I have is - How do I access the value of the checkbox within the save_post hook? A checkbox has a checked state, if it's present the metadata is saved, if not it's deleted. The nonce is used so our save_action doesn't fire everywhere, only when our code is running. The action save_post receives three arguments ($post_id, $post_object, $update) and we must check for posted values with $_POST after being sure our code runs on the right places. Why does Wordpress featured image not save when I publish my post?